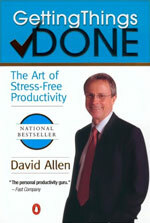 David Allen disciples believe the first step to productivity is to first capture all ideas and tasks. Sounds beyond obvious, no? Yet I – and I suspect many others – forget without regular reminders. The challenge with ubiquitous capture is to find a a tool that works for you. A quick audit of my jeans pockets presents a motley selection of newspaper cuttings, receipts, to do lists, reminders…. you get the idea. As of this week, that changes c/o Evernote. The software is a year old, so I might well be the last geek in the world to hear about it. But in case it has also passed you by, here’s why you need it in your arsenal of productivity tools. Evernote is a note-taking tool designed to capture, store and organise ‘to do’ items in one place: typed messages, scribbled notes, snapshots, photos, web pages, voice recordings. You can file all these scraps of data and information you store day-to-day in one place, as you go, and Evernote files and sorts them in a logical, highly usable way. For example, all images are scanned by OCR to make any text searchable in your archive. So if you take a snapshot of your shopping list, Evernote will read the text and archive it. Evernote comes in web, desktop and iPhone flavours, so there’s no excuse for ubiquitous capture not being, er, ubiquitous. In short, it seems like the ultimate ubiquitous capture tool. See Evernote in action below. PS. Seasoned Evernote user? I’d love to hear any tips and tricks in the comments.